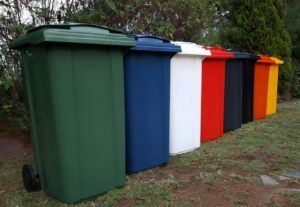 Wheelie bins for sale in Johannesburg Gauteng. Wheelie bins are our passion at Containa Pack. Hence we only sell the best quality bins. Our wheely bins are proudly made in South Africa and carry the SABS stamp of approval. Therefore they are made according to strict quality control measures. Consequently, our bins are strong and long-lasting. We expect our bins to last for more than 10 years. For this reason, the wheelie bins we sell have a five-year factory-backed guarantee. Containa Pack only sells the best quality because we believe over time a cheap price will become an expensive buy. Members of our team here at Containa Pack have been in the Industry for over 30 years. They were involved from the inception of the wheelie bin and waste collection in South Africa. Consequently we are able to give the very best advice concerning all aspects of waste management and the wheelie bin. SABS certified / ISO9001 compliant. Axles solid brite steel - electro galvanised. 5 year guarantee ensuring a long service life of 10 years plus. Manufactured from virgin polyethelene ultra violet stabilized. Suitable for African climatic conditions. Designed with additional honeycomb reinforcement. Robust and durable and made to German RAL specifications. The wheelie Bin’s large rubber tyres allow for ease of handling. The 240L wheelie bins are SABS certified and marked accordingly.